Delicious Dish. 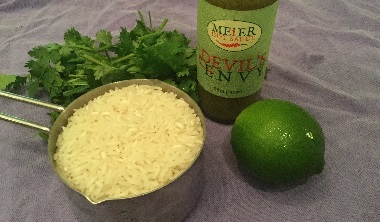 Devil's Envy Green Rice! Cook rice according to package instructions. Let sit for about 5 minutes. Stir well to combine. Salt to taste. In a large bowl, mix mayonnaise, Devil’s Envy Hot Sauce, chili powder and cumin. Add hot drained pasta to the bowl and toss to coat well. Let the mixture sit until room temperature. Add the chopped vegetables, grated carrots, cilantro and black beans and toss to mix. Add the cubed avocado just before serving. 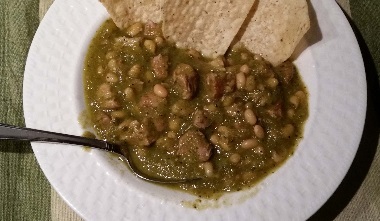 Ummmm - Devil's Envy Green Chili! 4-8 fresh jalapeño, stemmed and seeded - 4 is fairly mild, 8 is medium heat. Spray a baking sheet with cooking spray and place the tomatillos, quartered onion, jalapenos and garlic cloves on the baking tray. Roast the vegetables for 20 minutes flipping the vegetables at the 10 minute mark. The tomatillos should be lightly charred and the onion beginning to brown. Transfer the roasted vegetables and any remaining juice on the baking sheet to a food processor or blender. Blend until almost smooth. Add the cilantro leaves, Devil’s Envy Hot Sauce and salt and pulse a few more times until mixed. Pour into a large pot. Cut the pork roast into ½ inch X 1 inch pieces. Season well with salt and freshly ground black pepper. Place a large skillet over medium high heat and add 1 tablespoon olive oil and the butter. Transfer half of the pork to the skillet and cook for about 4 minutes on each side, turning once or twice until the pork is browned on all sides. 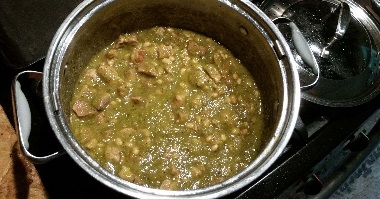 Transfer to the large pot with the green sauce, and repeat with remaining pork.